March will be Yu-Gi-Oh! Who should it be? BEHOLD! Nightmare Moon's layout, and the first layout of the newly renamed site! And not only is the name changed, the URL is different as well! Don't worry, the old one still redirects here, but our new URL is tdsomrp.forumotion.com . Why? 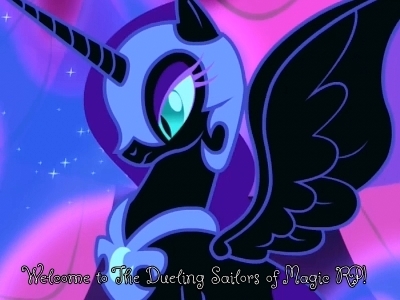 Because we are now officially The Dueling Sailors of Magic Roleplay! I've set the poll up for March's layout - it'll be YGO themed, so remember that if you pick "other." And on a different note, the first day of the RP torrent is finished, and all the MLP:FIM RPs are open for posting! ... after having summer school completely destroy me I am back. Subject: Re: 2/1/12 - Layout Update!